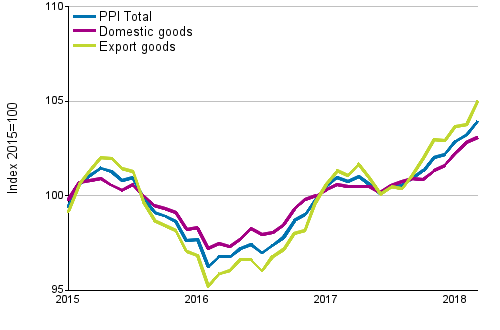 According to Statistics Finland, producer prices for manufactured products rose by an average of 3.1 per cent from March 2017 to March 2018. Producer prices for manufactured products sold on the domestic market rose by 2.6 per cent, while the producer prices of export products went up by 3.8 per cent. The rise in the producer prices for manufactured products was particularly caused by increased prices of pulp, paper, paperboard and cardboard, electricity as well as chemicals and chemical products from March 2017. The rising of producer prices was curbed particularly by fallen prices of waste and food. The Export Price Index rose by 3.7 per cent and the Import Price Index by 2.5 per cent in the year. The Basic Price Index for Domestic Supply went up by 2.7 per cent. The Basic Price Index for Domestic Supply including taxes went up by 2.8 per cent. Export prices were, in particular, boosted by the higher prices of pulp, paper, paperboard and cardboard, as well as chemicals and chemical products from March 2017. The rising of the prices was curbed above all by falls in the prices of waste. The rise in import prices was, in turn, especially caused by higher prices of waste and oil products compared with last year's March. The rising of the prices was curbed above all by falls in the prices of electronic appliances. From February to March, producer prices for manufactured products went up by 0.7 per cent. The rise was mainly due to increased prices of iron and steel from the previous month. Producer price indices have been revised and their base year is changed to 2015. In connection with the revision, the weight structures of the statistics were updated to correspond with the values of production, imports and exports for 2015. In addition, the commodity and enterprise samples were updated. The classification used in the releases is the CPA product classification instead of the previously used Standard Industrial Classification. Point figures calculated with the new base year become are in Statistics Finland's StatFin database. Calculation and publishing of data with base years 1949=100 and 2010=100 will continue. ISSN=1799-3695. March 2018. Helsinki: Statistics Finland [referred: 23.4.2019].